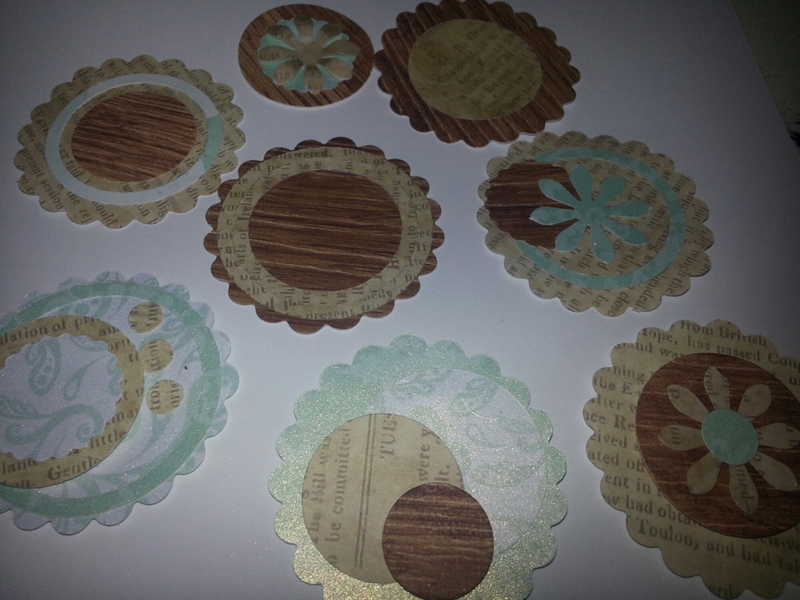 In a lot of pain today, so I surrounded myself with bits of paper and glued them together to make pretties. Not much to say about them, as they’re pretty straightforward, but I have been playing around with my big shot machine. My tip for cutting out small alphabets is to use adhesive paper. Saves on applying glue to small areas. However this doesn’t always work when using punches, as the second layer slips and cuts strange, but it depends on the paper and punch. To take this a step further, I found glitter tape, with a backing (so essentially long coiled glitter adhesive paper) this works well with small letters. If you can’t find tape with the backing, apply tape to a slightly slick surface, then die cut. If you have a collection of washi tapes and small dies or punches, this gives you a range of things to experiment with. I wish I felt this awake during the day! I just spent a couple of hours sorting beads and stuff for my craft room. If it wasn’t for the fact that my back will pay for it and that I was worried I’d wake my partner up, I’d have kept going. It’s nowhere near completion and I still can’t find so many things but I’ll get there. So I began making a lucky dip cars prompt box. I cut up words, themes, relationships, sketches and occasions, and threw them all in a box. The idea is to pick out two or more pieces of paper and create a card. I know a lot of combinations won’t work, such as daughter/valentines or pirate/sympathy, but I like to attempt what I call forced association. This is when you find two completely random ideas and make it work, find the common ground. It’s hard to explain, but you can do this with pictures. Find two pictures at random and try to find similarities. Sketch a new picture merging them together. You may use the colours of one, but the objects of the other. With cards, you may have a ninja theme with the pink glittery prompt or Gothic Christmas. It’s a challenge which is what I need sometimes. 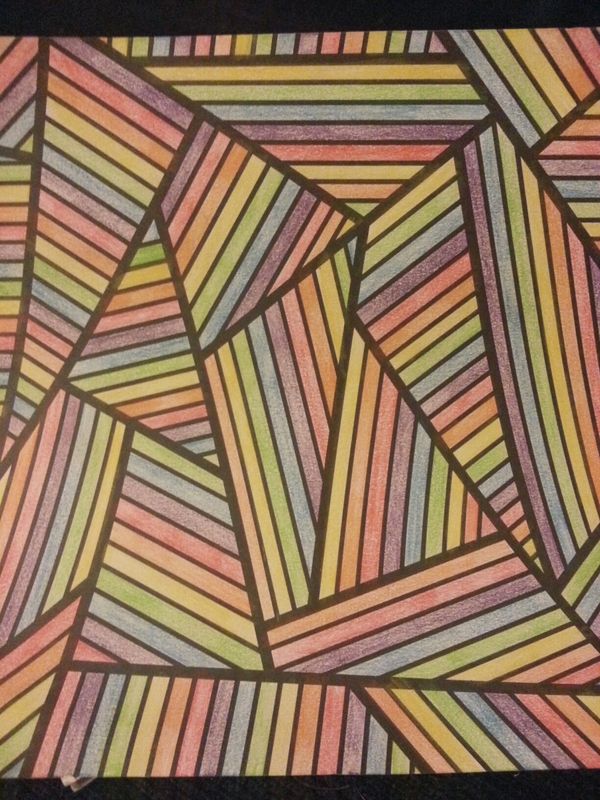 I had coloured pencils. I had black and white scrapbook paper. I coloured in. It looks more pastel from a distance. I like it. Only made one mistake… Shhhhh. I saw, on the internet, a lady who bought a whole load of embellishments only to figure out it was easier to make them yourself. 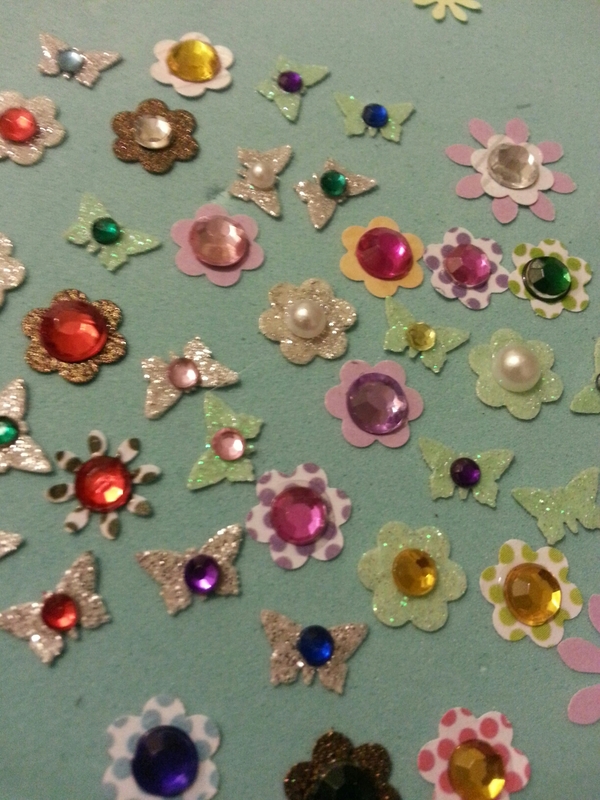 She punched flowers and circles out of glitter paper then stuck a rhinestone to the centre. So simple and so pretty. I couldn’t find and glitter paper, but I did find glittery washi tape, which I stuck to paper and punched out. It was fun matching colours and sizes of blings, each giving a different result. These would be great for any paper project. I might put glue dots on the back and stick to plastic, just like rhinestones to make them ready to use and easy to see. Made a stencil today for embellishment designs. I took a plain piece of copy paper and laminated it. Then I drew designs and cut them out with an exacto knife. This gave me the positive and negative images, which are both easy to use. If you wanted you could print or draw designs before laminating. I’ve always found just using card for stencils makes the edges messy after not too long. I think this would be a perfect technique for my miniature bear and other small patterns to transfer to fabric, all laid out efficiently. For some reason, recently stencils have become quite expensive, so if making your own is an option, I’d recommend it. I wonder if this would work with some other stenciling techniques. It may be harder to clean, unless you use a piece of plastic instead of paper in laminating. I used hot laminating. I’m not sure what the difference is but mine stuck to the paper when cut, just in case you were wondering. 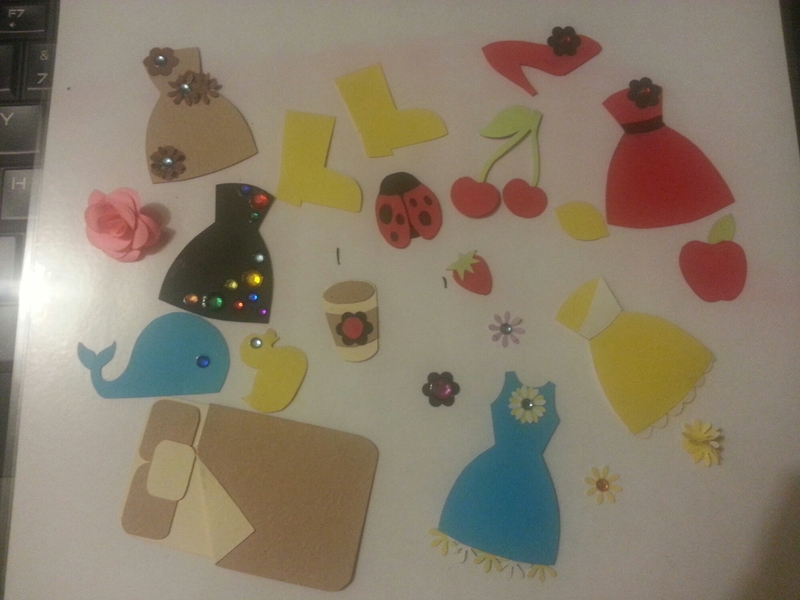 Making embellishments. It’s rather fun, as it doesn’t require a lot of planning and research, which is usually what puts me off projects. Just sketch a basic shape on the back of paper, cut out and glue bits on. 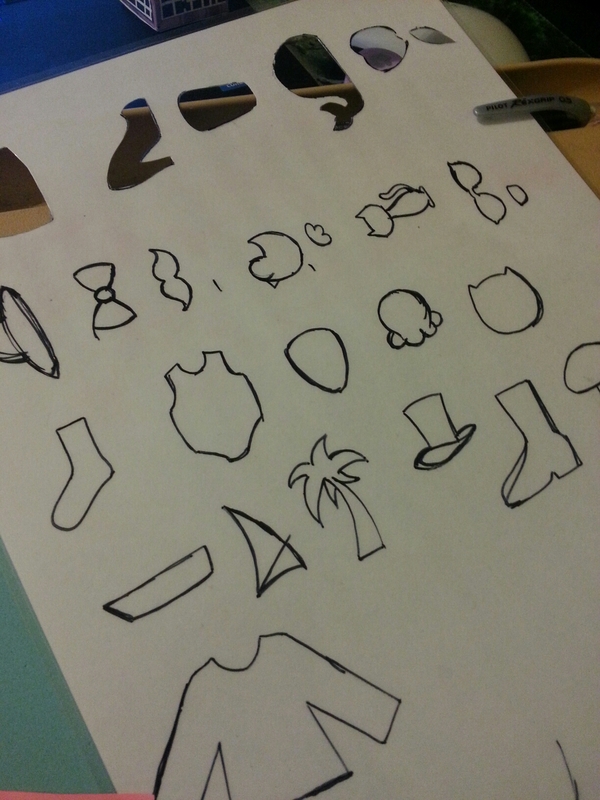 I ended up making a dress template so I could make multiple designs with the same basic shape. Most of them I did off the top of my head, so I couldn’t recreate them exactly, which makes it hard to make to sell lots of. Perhaps I’ll make more templates or a stencil for them. I’m also a bit worried that some of the paper I used was really thin and wouldn’t be a good base for sticking to projects. I’ll remember next time to use scrapbooking paper or thicker. I did quite a few bits today, including some tidying in the “Craft Cave” as my partner calls it. Unfortunately since an update to the wordpress app a while ago I can only seem to add one picture in the post when using my phone, so you only get to see one. Yesterday, I went bought these cheap metallic embroidery threads that were just really beautiful. I’ve had many issues with using these to embroider, so I used today to come up with other ways to use them. Firstly I knitted with them. The small swatch is as far as I got using 1.25mm needles before my hands died. Then I thought of laying them in lines as a background to a punched image. 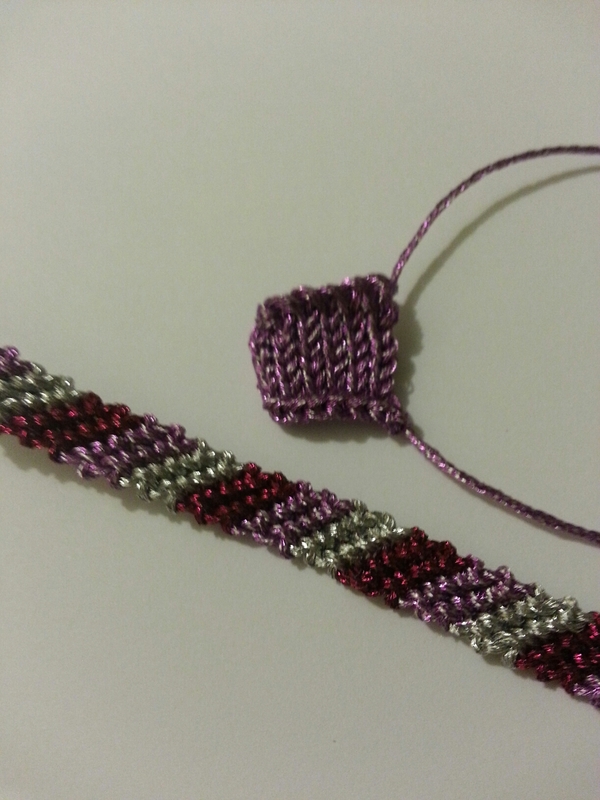 I was thinking on how to do this when I decided to knot a friendship bracelet instead. That worked nicely. Then I used a beading loom to weave some red and gold. I’m not good at keeping a consistent tension whilst weaving so it didnt work too well. 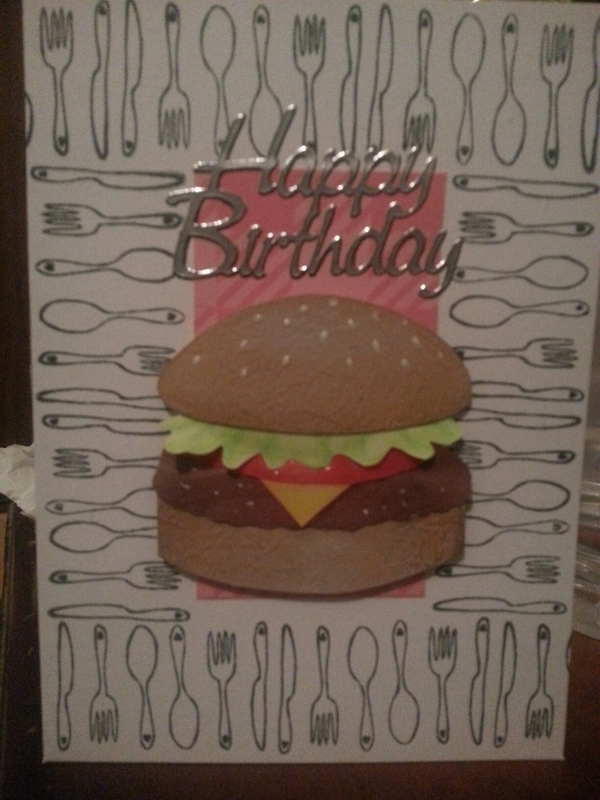 After this I changed location in the house, so I decided to change to card and paper embellishment making. 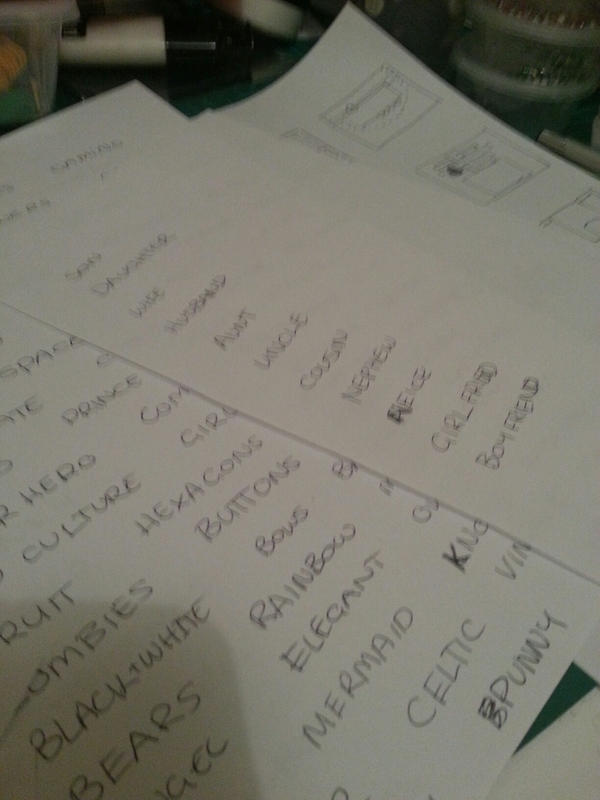 Last night I couldn’t sleep and came up with a long list of themes that I could make little designs for. I made one coffee cup before I came up with the idea of a mini banner builder. Basically, I cut out a bunch of banner triangles and put them in tiny bags. 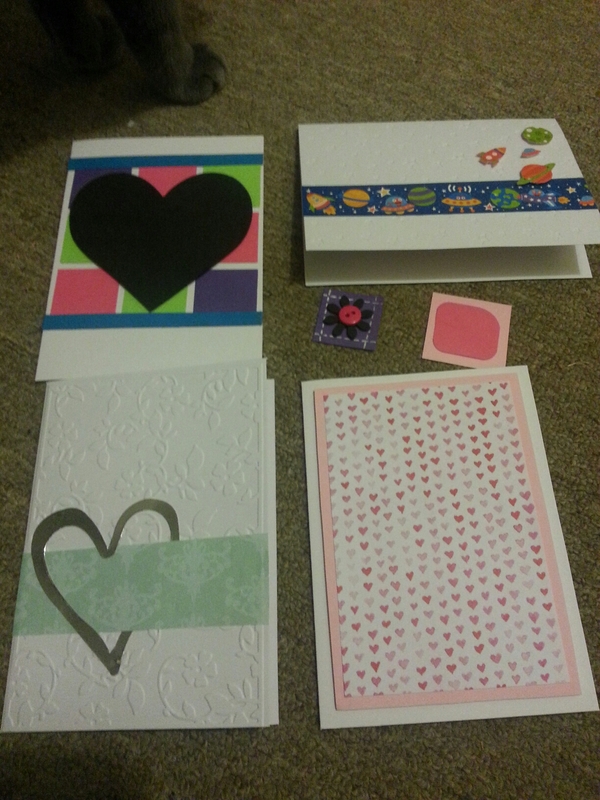 So I can mix and match and add letters and gems or whatever to make an easy banner on cards. Like a banner kit made out of patterned papers and I could use up tiny scraps. Thing is I’ve never had the want to use banners on my cards before. Might try it out. Might be lack of sleep. I get way too excited about things that I couldn’t be bothered doing. Technically I made this yesterday, but it needed to dry flat, so I couldn’t photograph it. My brother in laws birthday was this week. I haven’t known him too long, but I know he likes cars, women and food. So I picked the food genre. Mainly so I could use those cute knife, spoon and fork stamps, but also cars need to be specific and women could be controversial at a family gathering. I’m just proud that I decided to go in for it, followed it through and submitted something that I was rather happy with. There was quite strict ruling placed on the picture s after submission, so I don’t know if I could show you on here. I might link to my deviant art gallery later and it’s on there.